0 Comments Published by Cedric Benetti on Sunday, September 7, 2008 at 9/07/2008 06:23:00 PM. The exhibition everyone is talking about this fall: NY artist Jeff Koons and his first big retrospective in France, more precisely inside the state rooms of the castle of Versailles and its gardens, is hitting on some hard criticism from the French. The exhibition "Jeff Koons-Versailles" which will run from September 10th to December 14th (some say it might even run till January) will present some seventeen works of art by the most expensive artist alive. No one knows yet exactly what to expect, but one can be sure to find some controversial pieces inside the royal appartments. 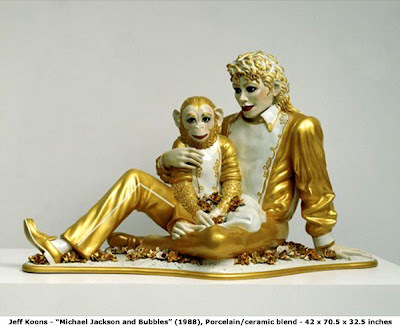 Michael Jackson and Bubbles in the royal bedroom? Balloon dogs in the gallery of mirrors? A giant flower puppy in the gardens? Expectations are high, and the critics are ready to shoot.